The mood at the Image Comics booth (#2729) on Saturday will be a celebratory one, as Image congratulates Brian K. Vaughan and Fiona Staples for SAGA’s three Eisner Awards (Best Writer, Best New Series, Best Continuing Series) and Brandon Graham for his Best Graphic Novel — Reprint Eisner win for KING CITY. 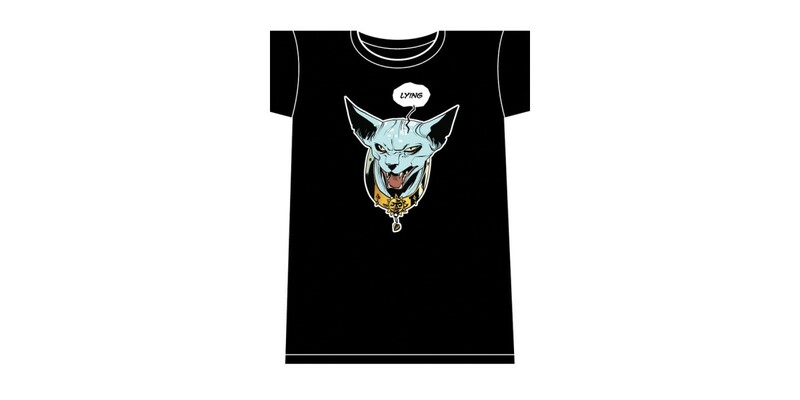 More news from the floor is that the Image Comics booth (#2729) has sold out of women’s SAGA “Lying Cat” T-shirts. Lying Cat T-shirts will be available in comic book stores, so those who want one of their should be sure to let their local retailer know! Copies of Image’s Comic-Con variants and exclusive continue to be available, so fans should stop by and get them while they can! Saturday’s signings will feature a two-hour block with the HAPPY! team — Grant Morrison and Darick Robertson! It will be Grant Morrison’s only signing at the Image booth during Comic-Con.A full signing schedule, list of variants and exclusives, and panel schedule can be found on the Image Comics website. Members of the media who wish to schedule interviews with Image talent at the show should contact Jennifer de Guzman, jenniferdeguzman@imagecomics.com. Twenty-One Years of Top Cow, Saturday, 7/21/13, 11:00am - 12:00pm, Room: 9Celebrate 21 years of Top Cow with founder Marc Silvestri and president Matt Hawkins along with a bevy of Top Cow creators and special guests! Be the first to hear exclusive information about the future of Cyber Force, Aphrodite IX, Witchblade, and the rest of the Top Cow Universe- in both the printed comics and other media. Get the inside scoop on the books that will comprise the next wave of Top Cow’s Minotaur Press imprint to follow in the wake of the smash hit Think Tank. And for those itching to break into comics and make a name for themselves, announcements concerning Top Cow’s Fall Talent Hunt will be unveiled. And if all of that wasn’t enough, as an added bonus, all attendees will receive a special limited-edition mini-lithograph! Join Robert Kirkman as well as Skybound writers and artists including Joshua Williamson, Matteo Scalera and Justin Jordan as they announce new Skybound titles and discuss what’s coming up in The Walking Dead, Invincible, Thief of Thieves, Ghosted, and more.